EEK! I Have Mouse Ears! The other day, Amy asked a question that comes up all of the time, so I thought I would post an answer because I know that others have this same question. In the first picture, you can see a sock toe. This toe was knit with some unknown stash yarn on Knit Picks size US#1 needles. I cast on 10 stitches on each needle using Judy’s Magic Cast-On. Then I increased every other row. The increases were worked 1-stitch in from each side. You can see that the increases have pulled the toe up on the sides and made little mouse ears stick up on the corners. (I’m very tempted to use the magic of photoshop to add little eyes and a little nose to that sock toe…) The toe looks very straight and boxy. 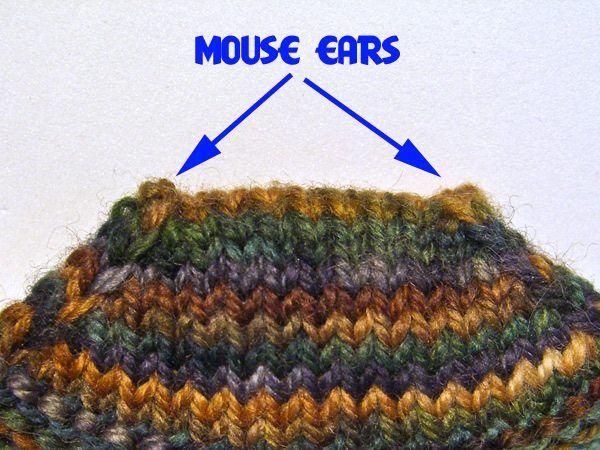 Many knitters, when faced with little mouse ears on their sock toes, try to alleviate the problem by pulling the cast on and the next few rounds tighter. And that only makes it worse. Although it doesn’t seem intuitive, what really solves the problem is loosening up. Let’s look at this second picture: same yarn, same needles, same techniques used. The only difference is that I cast on loosely. You can see that the little ears, rather than sticking up on top, lie nicely close to the toe and make a smooth, slightly rounded end. Why does this make such a difference? Let’s talk about what’s happening here. The increases pull the stitches on the sides of the toe out of alignment with the other stitches and make them march in a new direction. The point where the first increases are made is sort of like a one of those wonky intersections where streets converge at all angles. The stitches are all trying to go off in different directions, and they pull on each other a bit as they jostle for position. In the first picture, the cast-on stitches are so tight that they have no give. They can only lie straight in one direction. As the edge stitches try to change direction and march sideways at an angle, the rigid end stitches pull on them. The only direction the poor corner stitches can go is up. So they become little ears. In the second picture, the cast-on stitches are looser, so they can move around a bit. They help out the edge stitches by leaning very slightly towards the sides and curving upwards into a slight arc. This allows the corner stitches to relax and lie next to their neighbors instead of being pushed out of position. Use a size larger needles to do the cast-on, then knit the first round using the smaller size. If it still looks tight, also knit the first round with the larger size and switch to the smaller size on the first increase round. Try increasing two stitches in from the edge instead of one stitch. Having a larger section marching a new direction can help to mask any tension problems. But sometimes you might end up with elephant ears. Try a different increase. 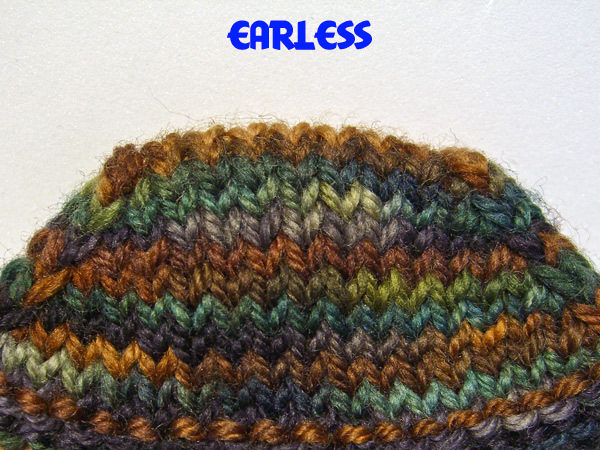 Look for an increase that doesn’t distort the stitches around it, or distorts them less. One to consider is a YO that’s knit twisted on the next round by knitting into its back loop. Twisting the YO closes the hole that it would normally make, and this increase can be made every round. Increase every round for the first 4 or 5 rounds, and then every other round for the rest of the toe. Having more stitches marching together can help everyone to line up nicely. P.S. Thanks for all of the suggestions on what the German Mystery Yarn might be. I’m so thrilled that #1 Son brought yarn back that I’m happy as a clam with it, whatever it is.